The Cathedral of Siena (Cathedral of Santa Maria Assunta) was consecrated in 1179 in the presence of the Sienese Pope Alexander III. Tradition has it that the current cathedral replaced an earlier church dedicated to Mary and erected around the ninth century. The dome was completed around 1262 while the works of masters such as Nicola Pisano and his son Giovanni were already underway, to which belong the sculptures of prophets and other statues now preserved in the Museo dell'Opera.The current statues are therefore copies that replaced the originals between 1800 and 1900. 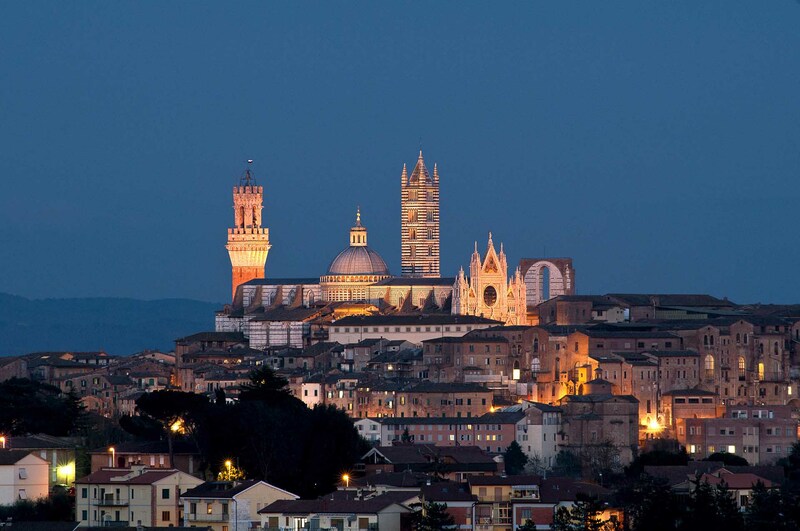 The Duomo of Siena is rich in masterpieces of Italian art performed through various centuries. The floor of the Cathedral, consists of fifty-six inlays in turn made by important Sienese artists, with the exception of the Colle della Sapienza, inlay by Pinturicchio (1505). The completion of this work took several centuries and ended only in the nineteenth century. As sculptures, the Duomo of Siena hosts outstanding works performed, among others, by Michelangelo (San Pietro and Paolo - San Pio and Sant'Agostino for the Piccolomini altar), Nicola Pisano (Pulpit) and Gian Lorenzo Bernini (Maria Maddalena and San Girolamo). The Cathedral of Siena also houses the famous Piccolomini Library with a cycle of frescoes by Pinturicchio and his collaborators. In the long windows the walls are preserved antiphonaries and graduals of 1400 and 1500 decorated with elaborate and precious miniatures. Even the windows of the Cathedral are of considerable value; the most famous, performed by Duccio di Buoninsegna, is nevertheless admirable in the Museo dell'Opera. In the Sacramento chapel you can admire two stained glass windows from Domenico Ghirlandaio's workshop. The beautiful choir was made by the renowned carver Fra Giovanni da Verona (1456-1525) who inserted thirty-eight inlays (originally placed in the choir of the abbey of Monteoliveto Maggiore) in the two wings of the fourteenth-century choir. Entrance to the Cathedral is upon payment, for more information and ticket reservations please click here.